Wine lovers rejoice for Bacchus is home to a good selection of wine. Be it affordable, or luxurious for collectors - they have it all. Located along Jalan Doraisamy, Bacchus is a pretty casual place with a cozy ambiance internally, while the outdoor seating area allows for a smoke. They are also a Spanish inspired tapas house, where the pairing of your glass of wine and some light snacks goes hand in hand. So for those of you who are in search of these elements, do feel free to head over to Bacchus Wine Bar today! CEO Wine, one of the brands that is brought in by Bacchus Wine Bar. For those who are interested, Bacchus is actually named after the Roman God of Wine. With that, they aim to not only offer premium and luxurious wine for collectors, but affordable ones for everyone else to enjoy as well. Who ever said that wine can only be indulged by the wealthy right? The best part of them all, Bacchus Wine Bar is offering happy hour promotion from 3pm - 9pm daily! Yes, even on the weekends! You can now enjoy 2 glasses of wine for RM25 only. That would only be RM12.50 per glass! Now what better way to sip on a glass of wine if it isn't served alongside some tapas. Tiny bite size pieces that is guilt-free and delicious! Fortunately, at Bacchus, that wouldn't be a problem as this Spanish inspired wine bar has much to offer. Small in size but big in flavour. Bacchus Wine Bar's Signature Pork Belly packs in a whole lot of flavour, and that is without adding additional salt to the already-smoked pork belly. It's rich, succulent and velvety. The meat is also incredibly tender! Alongside the broth on the side, a perfect serving to have with the croutons on the side. For those who are interested in a dish that is a little more empowering, than this humble serving of Garlic Prawns would be the perfect choice. It is a simple appetizer that consists of prawns, garlic and olive oil - that's it. An inspiration drawn from the Spanish dish of Gambas Al Ajillo. These chunks of dory may look a little boring, but the texture and flavour of the dish are absolutely delightful. The dory has a nice sear on the outside, which gave it that nice, thin and crisp layer. Internally, the flesh is incredibly moist, flaky and bouncy, which will definitely be a joy to have. Served with a homemade squid ink sauce on the side, which helps enriches the flavour of the dory by giving it that extra depth, this unassuming dish isn't so boring after all. Sausages anyone? This serving of Chorizo is done two ways - baked and fried. On the left, pretty standard, baked. But on the right, that's where things get a little more interesting. 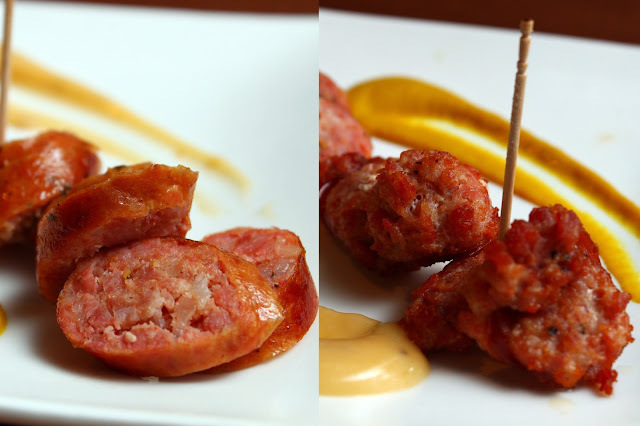 The texture of the chorizo is altered by the frying process, giving it a fairly odd and unique texture - similar to a popcorn chicken or some sort. It also envelopes in your mouth a whole lot better, providing flavour to every possible corner on your palate. Finally, something a little lighter and cleaner. 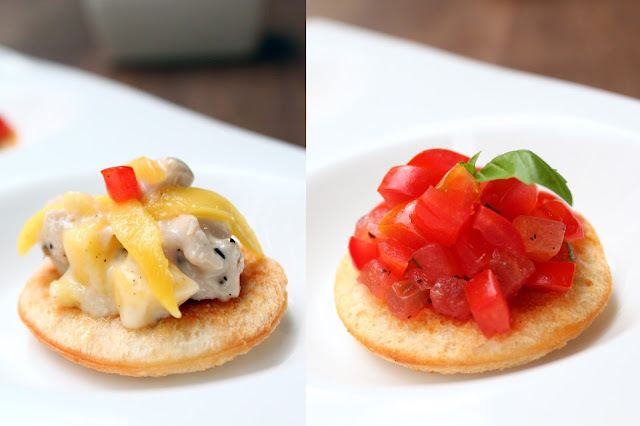 Bacchus Wine Bar's 3 Way Bruschetta is a great way to enjoy multiple flavours and texture on a single plate. You'll get the Creamy Mushroom (which is not in this photo), Mango Chicken and fresh tomatoes. It's light, it's addictive and you'll most probably order another! All and all, if you're looking for a place to chill out, relax, have a glass of wine and some light snacks, Bacchus might be the perfect place for you. With prices set as one of the lowest in town, you can now frequent there more often - let's not forget the RM25 for 2 glasses of wine happy hour promo!